Brazil : July 25 - August 10 - wonderpaars jimdo page! Our flight from Miami to Rio de Janeiro was pleasantly uneventful, even though we had our first flight fright when Alex couldn't find her ticket to Rio. Getting through customs in Brazil was also a breeze as was figuring out how to get to downtown because our hostel had arranged a taxi to pick us up. The ride from the airport to the city was probably about 30 to 40 minutes long and the most exciting part of that drive was passing the world-famous Samba dome. After arriving at the "Rio Hostel" we decided to take a walk up the hill into an artist neighborhood of Rio de Janeiro called Santa Teresa. This is a lovely little neighborhood somewhat safer than most and after a short walk we came to this little restaurant that was serving authentic German dishes. We couldn't resist and lunch was delicious. Strengthened in this manner, we continued and walked for almost 2 hours, eventually leaving town and walking through forested areas on the road that would eventually end up at the Christo. However, our feet grew tired and we decided to turn around, while enjoying the amazing views of the city below us. At times you could see down into the shantytowns (also known as favelas) and saw many little kites flying from rooftops keeping numerous kids entertained. To get back to the hostel we boarded a local bus and by accident got off a ittle bit too early. I guess they say better safe than sorry. The next morning we took our time getting up and did enjoy the breakfast upstairs. This hostel had a very interesting breakfast to offer: it was toasted a sandwich with melted cheese, some basic juice and tea. With two other hostel dwellers, we decided to visit the Christo to see the views of the city from above. It turned out to be a very wise decision because the view was amazing this day but the weather on the following days turned bad. After soaking in the views we allowed ourselves a nice hot chocolate in the café close by. The one thing that was very interesting about Rio at this time was that it was hosting the Americas Games, so we saw a lot of folks running around in country specific track suits. The rain started to kick in so we took the cab back to the hostel, chilled there for the afternoon. In the common area, Alex hing out with some of the other guests and when she came back to the room she shared with me that the conversation had turned to age and that one of the younger guys at looked at her and said "I am sorry, but aren't you too old to be satying in a hostel?" She replied very smartly that staying in hostels meant you got to meet people, which happens less frequently when you are in a hotel. And then shae added, "When it's noisy until 4am like last night, we are too old." At night we went down the hill to a neighborhood called Lapa with many restaurants and bars to have dinner. As we sat there we recognized some of the people staying in the hostel and joined their table. After dinner it was mutually agreed that some further drinks would be in order. We found a lovely bar that played some samba tunes and enjoyed some locally made mojitos. While the ladies of a group had enough for the night and walked back, the younger population of males (i.e. excluding me) was already to go out big. I almost joined them but then decided it would be wiser to go home with my wife. 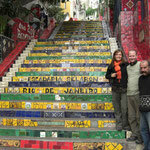 The stairs of Lapa, in the neighborhood of Santa Theresa, are an ongoing project. Tiles get added, get taken away, all at the whim of Selaron, the artist, who is originally from Chile. He started the project in 1990, when he moved into a builging bordering the stairs, that were falling apart and dingy. Now, it is an ever changing piece of art. The plan of this day was to follow the Lonely Planet walking tour of the city. We started at the Teatro Municipal, walked past the Convento Santo Antônio and ended up in the Praca de Republica. This park was interesting as it was home to numerous cats and funny little animals that looked like giant rats. The cats were being fed by the lovely elderly citizens of Rio de Janeiro. The whole thing looked like a cat picnic. By this time hunger was calling our attention and we ended up eating at a basic restaurant: buffet style where you pay for what you eat which is a very typical thing in Brazil. It was here where I discovered my love for a very specific soda drink: guarana. Oh, it just tasted so good. The rest of the afternoon we spentdoing activities such as, finding an ATM, having a coffee and a submarino (hot milk that is flavored when i chunk of chocolate is dropped in), checking out the harbor and the ferry terminal, visiting a local arts museum and enjoying a beer at a street-side bar and buying roasted nuts from local vendors. This time around we planned to take the tram back up the hill to our hostel. However we had a hard time finding the entrance to the station and when we did the line was so long that we decided we would be better off walking. We felt that nobody can visit Rio de Janeiro without checking out the Pao de Azucar (Sugar Loaf), so we started off from our hostel with quite a large group of Germans, Danes and other nationalities to visit this tourist attraction. The problem was the weather had gone bad and when we arrived on the top we only saw white fog everywhere. For Alexandra and me it was rather nice as it made us think about our home in San Francisco, but for the average tourist it was a rather sad sight. We understood what it must be like to come to SF and see the place where the Golden Gate Bridge is supposed to be, were it not covered in dense fog. Nevertheless, we had some fun watching a sailing race and taking pictures of the monkeys who live on the mountain. Since the weather wasn't very cooperative we decided to visit the National History Museum of Brazil. This museum was very impressive and Alex and I learned a lot about the history of this country. Once we were saturated with historic facts everyone was tired and ready to go back to the hostel. The problem was we were in a unsafe area and they weren't many taxicabs. For a few moments, it got quite scary. But we stuck together as a group and finally stopped two taxis that took us back to the hostel. During the afternoon two French guys had announced that they were looking for people who would be interested in going to the first training session of a Samba school, that was preparing for Carnival 2008. We were in, no questions asked. And so we found ourselves in a motorcade of three taxicabs on our way to a Rio de Janeiro neighborhood unknown to us. The moment we got out of our cars we knew we would be in for a very local experience. We had to buy our tickets at a booth that was a true hole in the wall. Once we got inside things changed. You could see that this place was gearing up for a major party but before we could join it we were offered a tour of the school. They showed us displays with information about the school's history, the many golden trophies that they had won and not without some pride a picture of Bill Clinton visiting the school in the 90's. After this tour we were free to join the party. It all started out with a lot of talking but very soon this was replaced with the rhythm of samba beats. Soon we were among the locals moving our bodies through the room doing whatever we could to resemble the samba the closest. We had a blast, and so did the people around us. These were the best moments we had Rio de Janeiro. 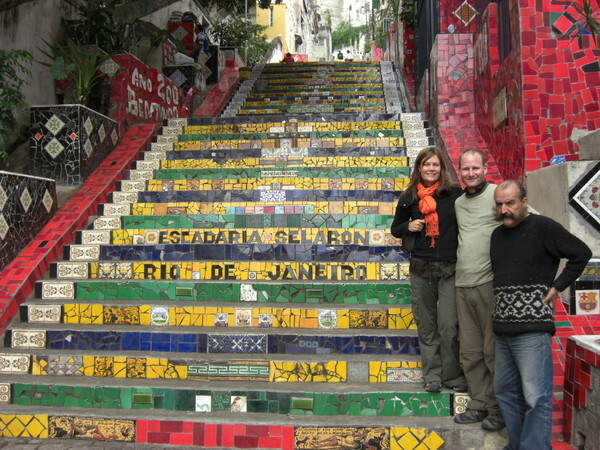 We had definitely arrived in Rio in wintertime. The next morning we took a trip to Copacabana and walked along the long stretch of beach dressed in rain gear and scarves. Since Rio was experiencing a storm, huge waves were coming in from the Atlantic Ocean. There was constant threat of rain and the wind was blowing hard. We still had a great time with Corrina, the German girl who had joined us today. Alex and I checked out the scene, had roasted corn on the cob as well as some kettle corn for dessert. I believe Alex also had the pleasure of enjoying a freshly opened coconut, because what the hell, we were on Copacabana Beach, weren't we? We had lunch at one of these typical Rio de Janeiro restaurants that allowed you to eat whatever you liked and only pay for what you got (by putting your food on a scale, and paying only for the weight). And boy, did they had a nice selection of desert dishes. We had one of the best desserts there and sadly did not think to remember the name. With full tummies we were finally able to go where I wanted to go all this week: Ipanema was next. And all I wanted to do was find that girl. But the weather gods were not on my side and soon after we arrived in Ipanema the heavens opened and the downpour began. We were just in time to get to a flea market with many rain-proof stalls so that we could do some shopping without getting too wet. Alexandra, even found the perfect pair of flip-flops, green and with the Brazilian flag on them (from Havaiannas - the Brazilian flipflop brand that is indestructible) while I was still looking for that girl. We used the time do some grocery shopping and then left Ipanema on the bus back home. Everyone could see the disappointment in my face, no matter how hard I looked I could not find the girl from Ipanema. I bet it was the weather. Our last day in Rio de Janeiro had arrived. We had seen a lot and were happy but realized that we had missed one interesting site very close to our hostel. 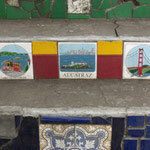 Over the years a local artist had converted regular stairs into stairs full of tiles. 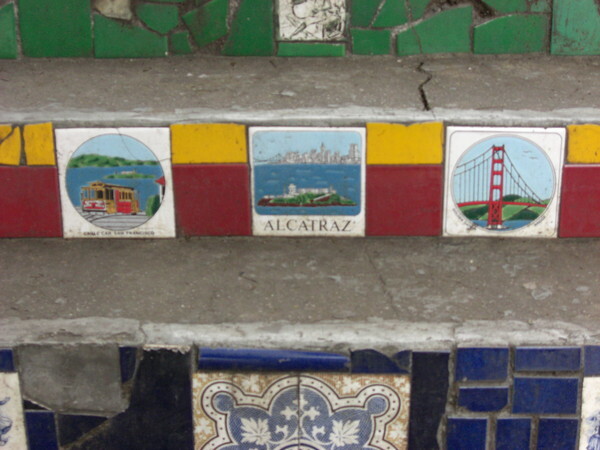 Most of these tiles were donated or sent from all over the globe. When we went to check these stairs out we had the luck that the artist was around. 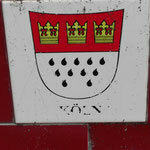 He even took the time to point out some of the most relevant tiles to us. 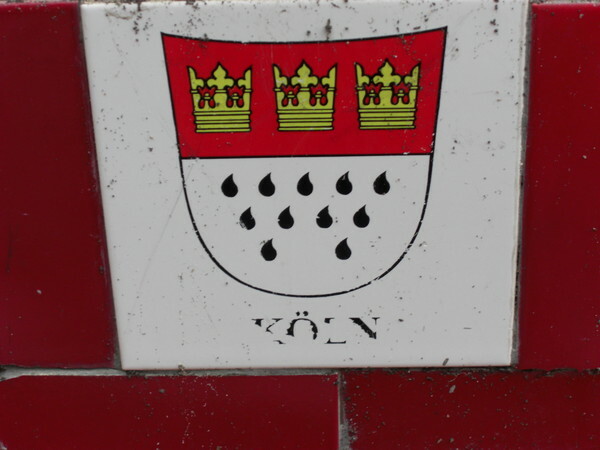 So we saw tiles from Texas, Bavaria, Cologne, San Francisco among many others. We continued down to finally get a ride on the Rio de Janeiro tram. This time we knew where to go and there was no line. Well, let's say almost no line and the little waiting we had to do was sweetened by the music of a small band playing in the station. We got on the train and rode over the one track only bridge. We passed the hostel and kept going until the end, turned around and rode back. An older lady with a businesslike looking suitcase climbed on board and instantly started to sell all sorts of goods from her suitcase. We saw dogs playing in the streets and Brazilian life in general. As the tram approached the hostel on its way back we hopped off and got our backpacks to go to the airport. At the airport, it turned out we were actually a little bit too late and started worrying about missing our plane because the line at the check-in counter was incredibly long and slow moving. What we didn't know is that that this was "business as usual" at a Brazilian airport. About one hour before the flight they started calling people who were scheduled to fly on our flight. We just followed the service personnel to a special counter where they would check us in. At the end, the flight was delayed and there was never a need to worry. Lesson learned. Finally, when the sun started to set we were taxiing for take off to Salvador de Bahia.